You’ll Love These 3 Amazing Zion National Park Winter Activities! Southern Utah is a great place to visit any time of year. Unlike many vacation destinations, it really comes to life in the winter. With plenty of opportunities to get outside and enjoy the snowy scenery, it’s the perfect place for a cold-weather vacation. When you plan your trip, make sure to check out some of the Zion National Park winter activities. In addition to all of the other great things to do in the area, they will make your winter getaway one to remember! Check out the following Zion National Park winter activities during your family’s next vacation. 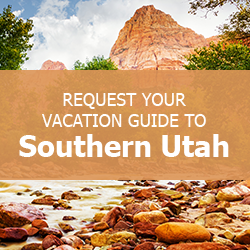 Before you come, make sure you download a copy of our complimentary Southern Utah Vacation Guide. It contains great suggestions for other fun family events, outdoor activities, restaurants, attractions, and all kinds of things to do in Southern Utah. When you download the Vacation Guide, you’ll have everything you need to make memories that your family will cherish for years to come. Check it out, and begin planning your ultimate Southern Utah family trip today! Hiking is one of the best Zion National Park winter activities. Lace up your boots, grab your winter coats and gear, and head out to explore the paths that are too hot to enjoy during the summer. The scenic drive in Zion National Park is accessible to private vehicles between November and March every year. If your crew would prefer to see the scenery of the park from the comfort of your heated family car, this is the way to go! The 6.5-mile road runs alongside the Virgin River. Get out to stretch your legs at the different stopping points along the way, or take pictures of the canyon and rock formations while still cozy in your seat. Cross-country skiing is another one of the classic Zion National Park winter activities that your family can enjoy. Travel with your group to Observation Point by way of the Zion Ponderosa’s plateau. The beautiful views are well worth the trip. Also, if everyone doesn’t know how to ski, or you prefer another method of getting there, you can also use snowshoes or hike. These Zion National Park winter activities are an exciting precursor to a cozy evening indoors with the family. Stay nearby in Brain Head or Panguitch Lake for easy access to all of the fun and a quick drive back to your vacation home. A Family Time Vacation Rental is the best place to stay for both fun and family bonding! Our gorgeous, spacious homes provide some of the best places to stay in Southern Utah! Filled with everything you need for a great trip, many Family Time Vacation Rentals are located in close vicinity to some of the best area activities, giving you easy access to plenty to enjoy. Bring your immediate family, or rent a larger home for a reunion or extended family trip. Contact us today! We look forward to helping you make memories during your next family getaway!